You must be aware that it is mandatory to produce Premium Paid Certificate for insurance policies to avail Income tax exemption benefit under section 80 C. Premium Paid Certificate is a document issued by an insurer against payment of the premium amount. This document is generally required for the policies premium paid via ECS and NACH mode. For all other modes of payment, you get a premium receipt which will act as proof for income tax benefit. If you have purchased LIC policy, and looking for the premium paid certificate you have three options. You can either contact your LIC agent, you can approach your branch office or you can download LIC Premium Paid Certificate Online. Out of these first two options are time consuming and cumbersome. Downloading LIC Premium Paid Certificate Online is a smart way which will save a lot of time. 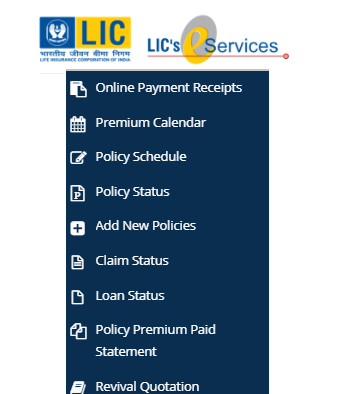 Life Insurance Corporation of India (LIC) has launched new facility of downloading LIC Premium Paid Certificate online via e-service portal. Follow steps given below to download LIC Premium Paid Certificate Online. The first step is to register online at LIC e-Services Portal. A facility of LIC e-Services is extended to a customer, branch manager, & agent. If you are already registered with e-Services use your User ID and Password for login. On the other hand, if you are new user you have to sign up for using this facility. You need to provide policy number, premium amount, mobile number, email and Aadhaar details for registration. The second step is to log in to LIC’s e-Service portal using your USER ID, Password and Birth date. Next step is to click on Basic Services option under My App. Basic service option allows you to access your premium calendar, policy schedule, claim status and policy premium paid statements. Once you click on Basic Service option you will be taken to the “Proceed” button. Press it to proceed further. Go to Policy Premium Paid Statement from left side navigation menu as shown in the image below. You will be taken to another page where you need to select Financial Year. Once you select the financial year system will display a list of policies along with installment premium details. You need to select a policy for which certificate is required. In case you are looking for a single consolidated statement, select all policies. Click on “Generate Statement” button given below the list and you will be able to download Premium Paid Statement in a PDF format. Make sure that your Pop-up blocker is turned off else you will not able to download/see the statement. The statement contains information about all selected policies including premium mode, amount, received date, collecting and servicing branch. If you find any mismatch in the statement you have to contact LIC local branch. Submit LIC Premium Paid Certificate to your employer and claim income tax exemption under section 80C. If you are facing any issue in downloading premium paid statement post your query in the comment section I will try to answer it as early as possible. “Unable to Connect the service, please try again later” window is displayed while downloading premium paid certificate for the FY 2018-19 ? The website may be down for few min.Kindly try now it is working. 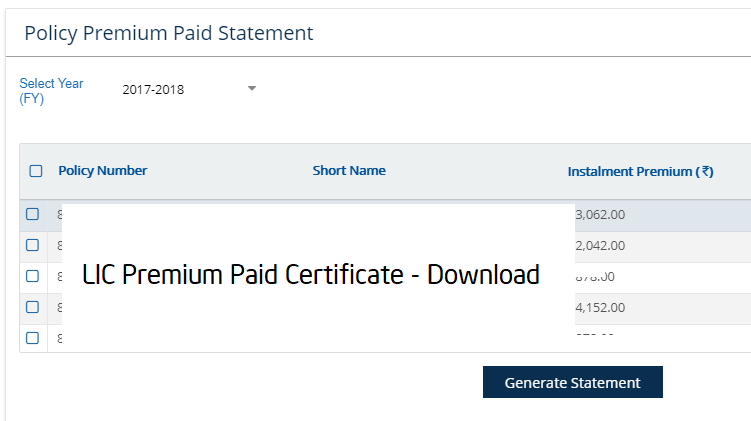 I found out my premium paid certificate. But my due is every 3 months once which means 4 times a year. for this financial error its during MAY AUGUST NOVEMBER and then FEBRUARY. I have to submit my actual in December itself. But the statement which I could view now is only for MAY AUGUST and NOVEMBER. But I need a statement which includes the payment for complete financial year which also includes my last due on FEBRUARY. Do you have any suggestions? Premium statement can not be generated for future premium. You can generate statement for the paid premium only. I am unableto dow load lic premium paid certificate because of my Pop-up blocker is in off mode how i can turned on mode please guide me. Kindly turnoff your popup blocker from browser top bar.Settings are different for different browser. Follow the steps given in article to download premium paying certificate. Many thanks for this useful information. But, how to add ‘spouse’ policies? I have tried from the portal. The drop-down menu gives only one choice i.e. self and does not give the choice of ‘spouse’ despite that I have gone into the menu by clicking on ‘Spouse Policies’. Follow the steps given below to register Policies of Spouse. Login to Portal. You will be able to see Self Policies and Spouse Policies.Click on Spouse Polices. It will redirect you to the new page. Click on Add Policy link (top left corner). Enter Policy Number and Relationship detail and press submit button. While clicking on ‘spouse policy’s, no new page is opening and that’s why I wrote the comment. I think it is a local issue of your browser. Request you to update your browser or try with other browser. I am using latest chrome browser and it is working without any issue.